What is the capacity of the ballrooms? The ballrooms hold a maximum of 500 guests for a cocktail-style party and 350 guests seated. Depends on tables and layouts. Buffet stations will be decorated by Ruffino’s Catering. You can bring in your own decorations and centerpieces, or we can assist you. Can we bring in our own alcohol or catering? No, all alcohol must be purchased through Ruffino’s catering, and no outside caterers are permitted. What is included in the menu price? The venue rental, tables, chairs, linens, china, glassware, flatware, setup and cleanup. Yes, events over 100 guests will require a security officer and will be provided by Ruffino’s catering. Can we have a a DJ or band? Ruffino’s Catering must approve all DJ and band services. This is to ensure the quality and elegance of your event. Does Ruffino's supply A/V equipment? We have limited in-house A/V equipment. If you need A/V equipment, we can order it for you. The order must be placed 48 hours in advance, and the A/V charge will be added to your final bill on the night of your event. Downtown Baton Rouge has plenty of on-street and off-street parking. 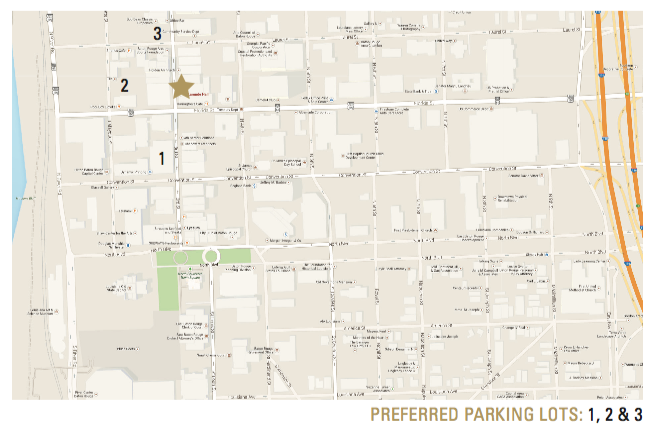 See map for preferred parking. Identification is required for anyone appearing under the age of 30. Also, we have the right to refuse alcohol service to anyone whom we judge as visibly intoxicated. Anyone under 21 years of age will not be included in the cost of the bar. Children in arms are not included in the cost. If it is a seated meal, children 10 and under will be offered a children’s menu. Events are allowed three hours. Available times are between 10:00 AM and 12:00 AM. When will I be able to gain access to the ballroom? You can access the ballroom two hours before your event. What room will my party be placed in? We reserve the right to place your party in the ballroom that will best fit your needs. How do we reserve the space? A signed contract and deposit are required with all bookings. Deposits are non-refundable and non-transferable. When is the menu and bar selection due? Menu and bar selections must be made 30 days prior to your event. You are allowed up to three separate checks. The guaranteed number of guests is required 14 days prior to the event. The final number is the minimum amount of guests for which you will be billed. Final payment is due at the conclusion of the event. All prices are subject to a 20% service charge and 10% Baton Rouge sales tax. A $500 deposit is required at signing. What if we need to cancel the date? There will be a $500 cancellation fee if you cancel within 30 days of the event.